Take a flight with backcountry expert Todd Peterson as he explores some of the remote and beautiful country featured in Galen Hanselman's "Fly Idaho!" pilot's guide. 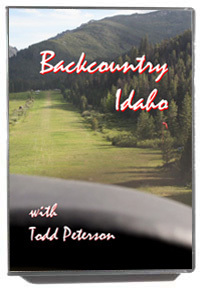 "Backcountry Idaho allows you to encounter many of my favorite strips and experience the challenge and majesty of backcountry flight. I loved it!" Fly right seat on the actual approaches and departures of these spectacular backcountry airstrips with Todd at the controls of his high-performance, custom designed, King Katmai. "While the videography is spectacular, this DVD is also filled with helpful and interesting comments for both pilots and passengers." "How To Effectively Buy A Used Airplane" DVD is highly acclaimed and his AnywhereMapTM basic training videos have helped thousands of pilots world-wide. © 2005 - Present by Bill Roberts Enterprises - All Rights Reserved.